We’re eating cheesy potato, broccoli and piquillo pepper soup garnished with gremolata, crumbled bacon and blue cheese. Okay, I know it’s the peak of summer and tons of places are sweltering right now. In this heat I imagine most people would rather eat a cucumber for dinner than cook a hearty potato soup on the stove top. Unfortunately I am not most people and when I get a hankering for something I just gotsta fill it! Last winter Nicole invited us over for a bowl of delicious Potato & Leek Soup. It was sooooo good. Seriously, it was like eating a soupy bowl of baked potato (with some sourdough to dunk into it!). Trust me, it was better than that sounds. Hands down it was the best potato soup I had eaten. 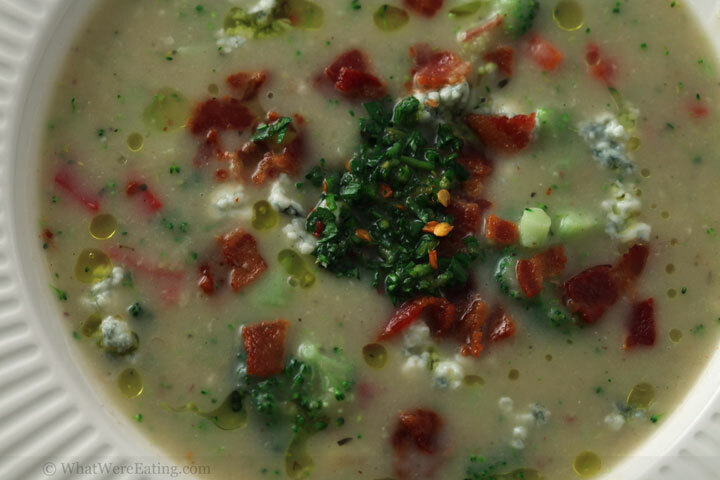 It was the craving for Nicole’s hearty, comforting soup mixed with the desire for some broccoli & cheese soup that inspired me to make this dish. Both Tyler and I loved it and thought the soup was even better on the second day after having a chance for the flavors to meld over night. The addition of the gremolata as a garish was a must! It definitely brought a bright flavor that the soup was otherwise lacking. Preheat a medium-sized pot over medium heat. Add canola oil to the pot. Once the oil is hot, add the chopped onion. Saute the onion until translucent, about 10 minutes, stirring occasionally. Add the garlic and dried basil & oregano to the pot. Stir. Saute for 1 more minute. Add the sliced potatoes and chicken stock to the pan. Raise the heat to medium-high. Stir. Bring the stock and potatoes to a boil. Let the soup boil until the potatoes are tender and start to fall apart with a fork when pierced. Reduce heat to medium. Using a potato masher, mash the potatoes into the stock, leaving some large chunks. Add the broccoli florets to the soup. Cook another ten minutes. At this point, pour half of the soup into a food processor or blender. Process until smooth. Pour the blended soup back into the pot with the chunky soup. Stir to combine. Add the piquillo peppers and skim milk to the pot. Stir to combine. Allow the soup to simmer for another 10 minutes over medium to medium-low heat. While the soup is simmering, make the gremolata. In a small bowl mix together the chopped parsley, garlic, lemon zest and red pepper flakes. Stir to combine thoroughly. Finally add the blue cheese and sharp cheddar to the pot. Stir until the cheese completely melts into the soup. Taste the soup then adjust the seasoning as desired with kosher salt and freshly cracked black pepper. To serve, garnish with a spoon full of the gremolata in the center and a sprinkle of blue cheese and bacon. Enjoy! First!! Ok seriously though, I’m pretty much always up for a good soup. Besides, it’s always cold somewhere on the planet. For me the cool thing about this soup is that it wasn’t made with tons of cream or fat. Normally I’m more of a brothy soup fan, but this one really hit the spot by not being too heavy. I made broccoli soup two nights ago! I ‘enhanced’ it with kale because I hardly had any broccoli. Funny thing is that I was wishing I had added potato because it didn’t thicken enough with what I did (made a basic white sauce and stirred it in). Oh well, the flavor was good and kind of satisfied my craving for broccoli soup. I put sharp cheddar on top. tyler- i agree! although the soup had some cheese in it it didn’t really seem too heavy at all! actually i could go for some more of this soup right now! only it would be old and skunky since we ate it over a week ago..
That’s really bizarre, mine weren’t the least bit fibrous…they were as crisp as chips and crumbled in my mouth. This looks awesome! Your guy’s watermelon salad with feta, peaches and jalepenos was awesome, so i’ll definitely try this!